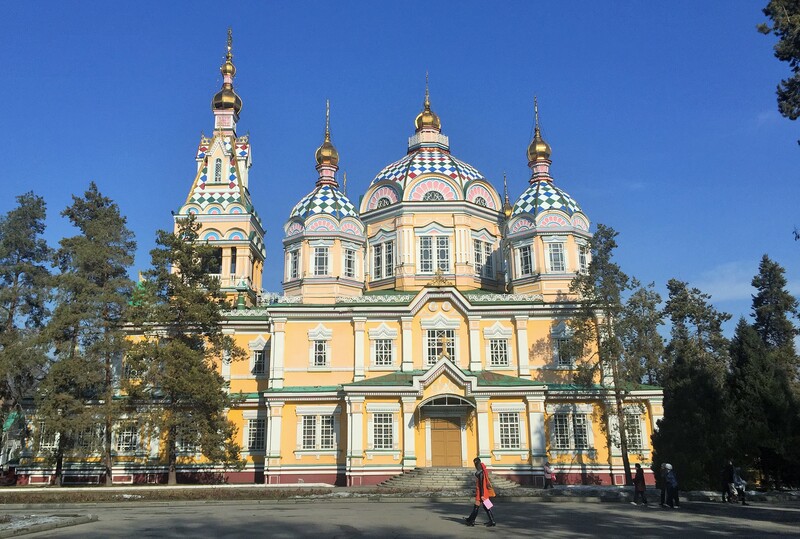 Almaty was Kazakhstan’s capital until 1997 when the President moved it to a tiny town, Astana, in the middle of the steppes in the north of the country. No one officially knows why but some of the less incredible reasons I’ve heard include a) he wanted to be closer to control northern dissident tribes b) he wanted to increase trade with Russia and c) he was worried about China and no army would travel all the way to Astana to invade. 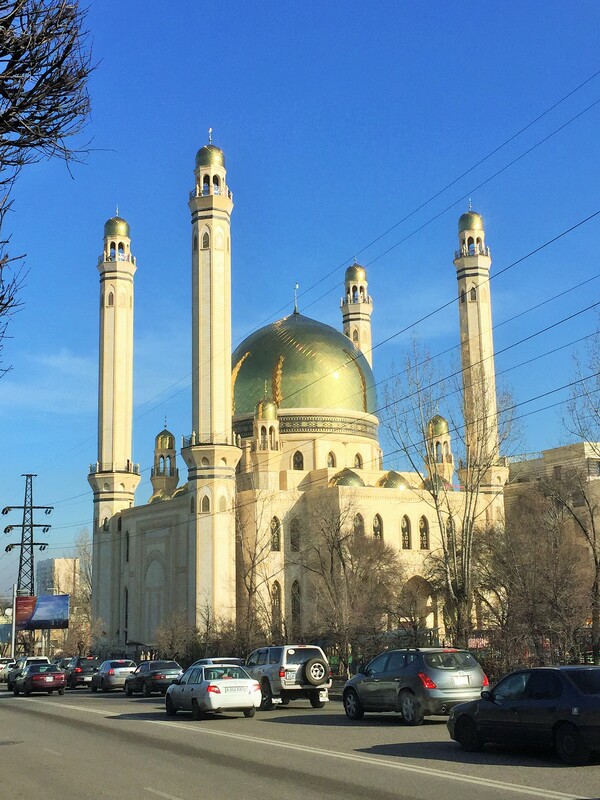 While Astana has grown into a mini-Singapore, Almaty has stagnated a bit but remains an ethnic melting pot. However, when I was met with blank faces from a colleague, a driver and a hotel receptionist when I asked them what to see in town, I was worried this would turn out to be another Jakarta. It would not, and any preconception I might have had about Almaty was wrong. Far from being like it’s depicted in Borat, it was full of history and memorable sights. So, on the morning of St Valentine’s Day, I mapped out a rough 25km circuit which picked up some of the few sights the local tourism office actually boasts about. In the shade, it was bloody nippy to say the least with temperatures hovering comfortably beneath zero degrees. In the sun, it felt warmer and the city transformed itself into a beautiful scene with two sides of the city surrounded by stunning 3,500 metre high peaks only 30 minutes’ drive from the town centre. From the plane the night before, the town looked flat but, in practice, I was wrong. Well, technically, I was right actually. It was flat, but not horizontally so. With very few undulating hills, the whole city was built on one big slope running north to south (and, if you’re being a geeky geologist, I would reckon the whole city is built on an alluvial fan). So, in one direction, it was always easy. In the other, always hard! 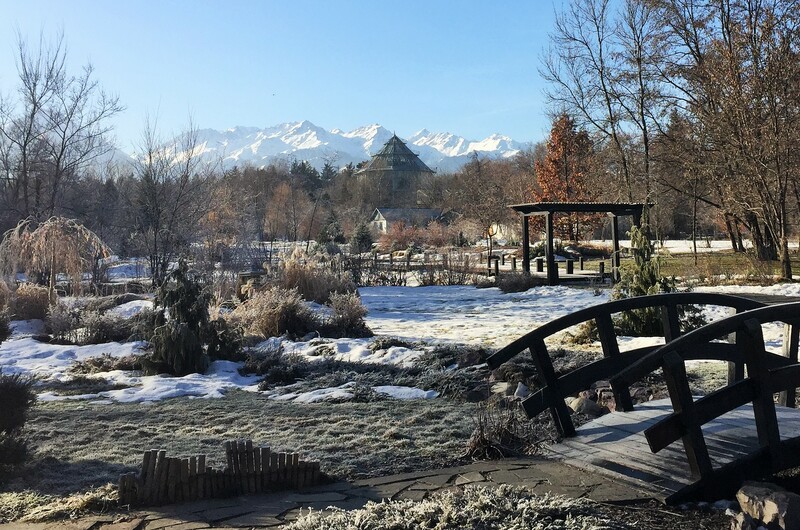 I reached my first spot, the Botanical Gardens, which were stunning with an alpine backdrop, blue skies, frosted vegetation and not a soul in sight. As I made my way around the park, this loneliness started to become concerning as, even though I’d only run a few kilometres, I was really struggling to breathe. 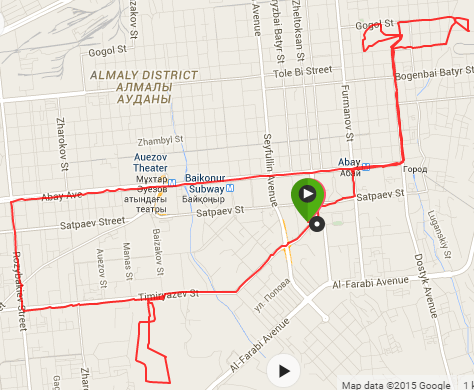 I wondered whether maybe Almaty was a lot higher than planned and got my phone out to check. Nope, only 900m. Then, I turned away from the hills and observed a thickening orange/grey blanket building up over town: being trapped without wind between all these major peaks, car emissions have made the city horrifically polluted. Maybe this would be like Jakarta! Knowing it was external factors making me struggle, I soon felt better and decided to go westwards, not too sure of what to expect or fear. At each intersection, I would be amazed by the politeness of the drivers: they all, without exception, stopped if they saw I might want to cross. And, as we’d find out later when locals drove us down the mountain when we got stuck in snow halfway up, locals are some of the friendliest and most hospitable whom I’ve come across in my travels (at least my short experience of them). Having said that, I later witnessed a police car with full sirens pulling someone over for only slowing down rather than coming to a full stop at a Stop sign so they have quite a draconian application of the road code here! Most people I went past stared at me. In the five hours I ran in Kazakhstan, I don’t think I crossed a single other runner, let alone one in shorts so I guess it wasn’t that surprising. Nevertheless, the constant stares were starting to make me wonder if I was actually naked but under the delusion that I was dressed. 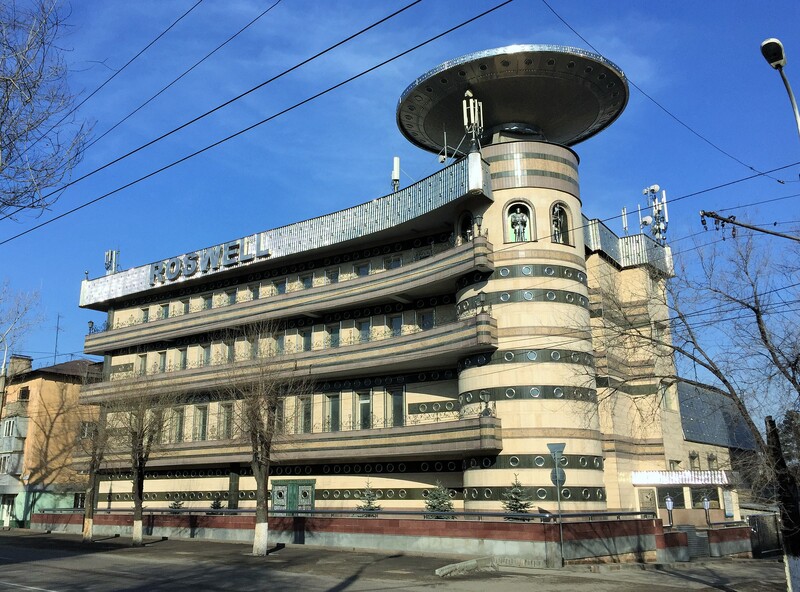 Although not designed for runners, the Soviet layout with wide roads and pedestrian walkways meant Almaty was very easy to run round, even though a gas mask would have come in handy. I soon stumbled upon Area 51 as I went past a curious building called ‘Roswell’ which had a giant, silver, UFO on its roof and alien spacefolk beneath it before heading towards a brand spanking new shiny mosque that I spotted in the distance. As I ran down Abay Road (after that most famous poet), I went past another wide array of statues of animal, men (no women) and objects before hitting a popular bit of town, where heart-shaped balloon sellers were making a wild trade from cornered couples feeling obliged to indulge in some western consumerism. I kept going downhill (northwards) towards 28 Guardsmen Park which plays host to a war memorial and the famous Zenkov’s Cathedral. More and more people were staring at me and trying to say things which probably stretched from “aren’t you cold” to “you are mad” to “why are you naked Sir?”. As I reached the war memorial, a group of school children laughed and tried speaking to me. Much to their delight, I wasn’t a local and they took a few photos of me before disappearing. I would cross them again 10 minutes later and assumed that would be the last of them that I saw. Anyway, I’d now reached twenty kilometres and it was time to head back. Once again, I’d have to go through 28 Guardsmen Park. Somehow, through miraculous mitosis or something, the few schoolchildren had now become about 20 and I would once again be going past them. Shortly after I went by, I could hear some screaming coming from behind me. I briefly looked over my shoulder to see a group of young teenagers, dressed for the winter, trying to keep up with me but I kept going. Eventually, the screaming died down but I checked and one valiant child, complete with thick winter coat and schoolbag, was using every ounce of energy he had left to stay within shouting distance. Feeling a bit sorry for him, I slowed down and stopped. By the time he reached me, the poor kid’s sweaty face was absolutely drained of blood but he was on cloud nine. The scene got weirder as he was soon heroically joined by his giggly and giddy classmates, one of whom spoke enough English for her to tell her friends I was Simon, from London, which was seemingly very exciting. Our top-end diplomacy and cultural exchange ended there (Yalta diplomacy, this was not) and, about 20 selfies later and a polite decline to their request for my Facebook contact details, I ran off. 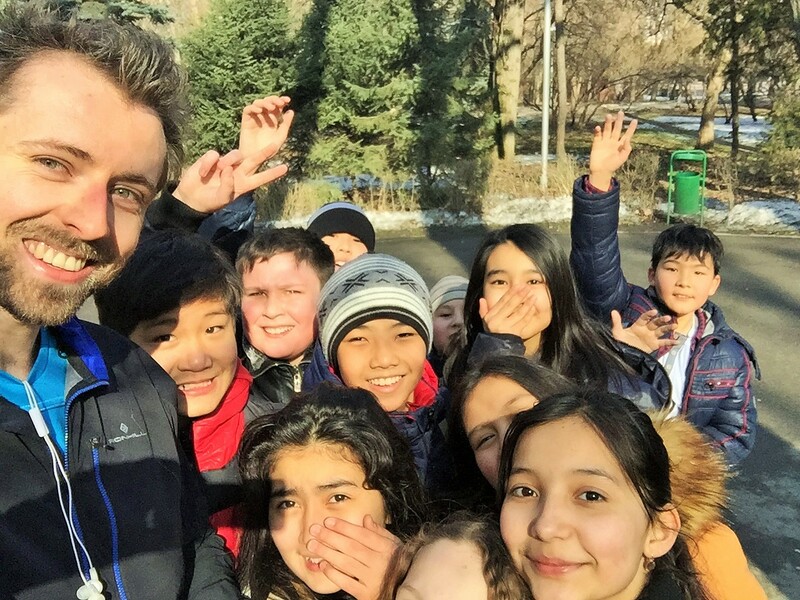 So now I know that a) going for a run b) in shorts c) in February d) while not speaking Russian turns you into a (very) minor celebrity amongst teenagers in Kazakhstan! Fame, at last! Having said that, they were also very excited by a squirrel which ran by so maybe that’s maybe that’s who I’m competing with for the attention of Generation Y: a grey squirrel. Sigh. On my way back, the pollution – and my breathing and coughing, were getting worse by the minute as I went past my last few sights: another huge statue of Abay, a mini replica of the Eiffel Tower and various monuments on Republic Square. Everyone was still staring at me (hopefully they weren’t still saying I was naked or those selfies might have been somewhat dodgier than planned) and I had by this point more or less accepted that it is a fact that, whichever country you’re in, people in shorts and a t-shirt in February are considered abnormal. View from Shymbulak at 3,200m. Almaty is under the toxic orange cloud at the bottom left. And then, with the sky increasingly looking like it was on fire, I was back, ready to get showered, changed, fed and stuck up a mountain. 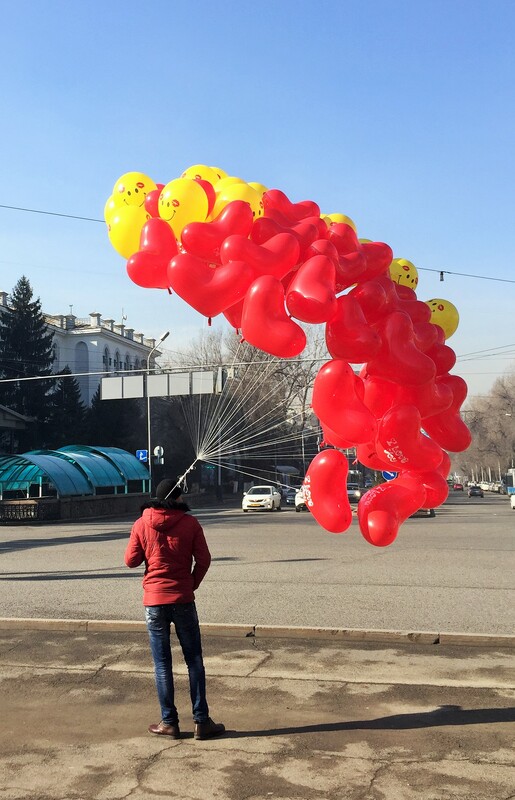 All in all, a normal day’s work in Almaty! Most blog posts are more past-time than genuinely interesting and worthwhile – this was one of the more interesting and whorthwhile I’ve read in a really long time. Great post and I’m going to go check out the rest now. Thanks for sharing!